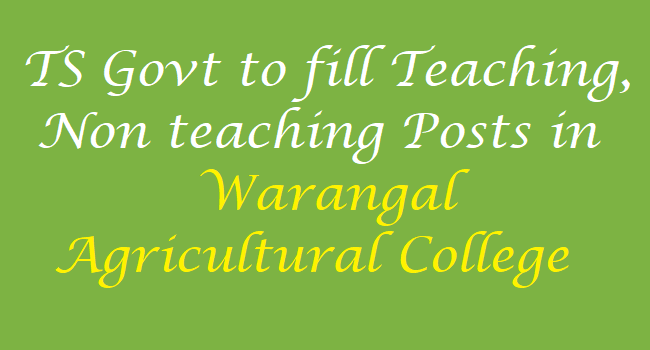 TS To fill Warangal Agricultural College Teaching, Non teaching Posts: TS to fill the Professor, Associate Professor, Assistant Professor posts in Warangal Agricultural College and Various Non Teaching posts to be filled in this college also. As per the GO.81 TS Government has accorded for creation of (68) sixty eight posts in various categories to newly established Agricultural College at Warangal. Permission also hereby accorded to outsource the functions of the following services in terms of G.O.Rt.No.2246, Finance (SMPC) Department, dt.07.06.2007 through service providers to discharge multipurpose functions in the college. GOVERNMENT OF TELANGANA Agriculture & Cooperation Department - Creation of posts to newly established Agricultural College at Warangal-Orders - Issued. 2. A&C. Dept., U.O.Note No.278/Agri-III(1)/2016, dated.26.04.2017. In the reference 1st read above, Government accorded administrative sanction for newly established Agricultural College at Warangal. 2. 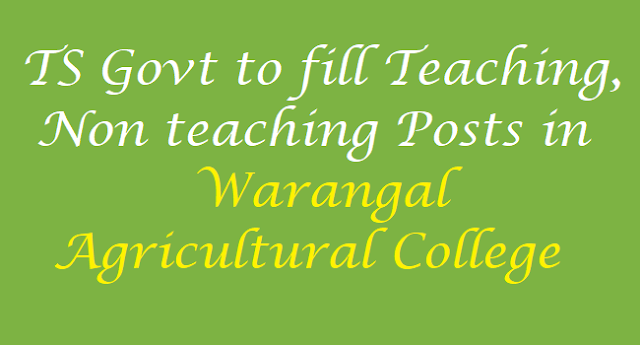 In the reference 2nd read above, the Agriculture & Cooperation Department have proposed for creation of (112) one hundred and twelve posts to newly established Agricultural College at Warangal District. 5. The Agriculture & Cooperation Department shall obtain concurrence of Finance (HRM-II) Department before initiating measures to fill up the posts sanctioned in this order, wherever service rules prescribe direct recruitment.